About Us | Pats Auto, Inc.
Gratiot County’s People’s Choice winner for the last ten years! Pat’s Auto, Inc is a certified collision repair shop and is a member of the Automobile Service Association(ASA). We know what it takes to do a quality repair on your automobile. 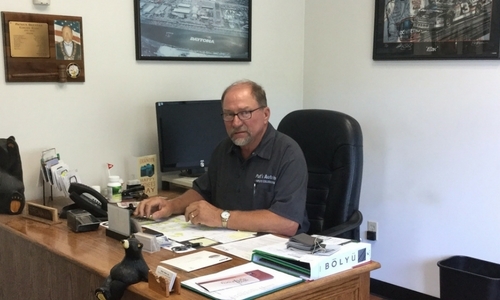 Pat was born and raised in Gratiot county and automobile repair has been his life. Pat’s Auto Inc. is family owned and has been in business since 1982. We will work with your insurance company. We will work from your insurance company’s estimate and we will guarantee our work for as long as you own your vehicle. You have no worries – we will take care of everything for you. The only thing you will be responsible for is your deductible if you have one. It is illegal for Insurance companies to strong-arm you to use one of their DRP shops. It’s your vehicle, you can have it repaired anywhere you wish. We work with all insurance companies including State Farm. Visit Our Auto Body Shop or Make an Appointment Today! Pat’s Auto did a wonderful job fixing my car! And I was very glad to see they detailed the inside also! Thank you for the awesome work! You did a fantastic job on my truck (Toyota) – Looks brand new. You guys always do a good job. Thanks so much! Peggy and I are most pleased with our silver 5-10. It is so neat and clean both inside and out that we really hate to even drive it. It was thoughtful of you to take the time and effort to do all those extras that you did for me, especially the gas tank, the undercoating, and the front bumper are just a few. Pat’s Auto is the best! I have had 3 different vehicles fixed at Pat’s. I will never go anywhere else for vehicle repairs! Terrific job! Would not go anywhere else for body shop/ paint work. Recently had my 2014 300c in, and they did a fantastic job! Excellent work, and excellent staff! The fine people at Pat’s took great care of Laura’s little mishap. I am in awe of the quality work and attention to detail. Thank you for helping us get through a crummy situation. These guys do an exceptional job!!!!! We only bring our cars to them and recommend them to everyone. Thanks for your support. It’s been a good year! Thanks so much for the fantastic work and paint to revitalize our VW bus. Instead of watching it slowly show its age we can smile and glean at its new appearance. Highly recommended……Have had Pats work on several of my vehicles always a wonderful experience from start to finish they take pride in every job! Thanks again for taking care of us!